Southern Utah University’s W. Edwards Deming Incubator for Quality, Innovation, and Leadership is hosting The Bryce Canyon Society Forum: W. Edwards Deming in the 21st Century - In Search of Excellence on April 3, 2019 at SUU Aviation’s main hangar. While most business leaders today are familiar with lean management, six-sigma quality, and Zero-Defects principles, they may not have been introduced to Dr. W. Edwards Deming and his trademarked systems philosophy that inspires them. Widely known as the father of Total Quality Management (TQM), Dr. Deming pioneered the management philosophy behind the success of companies like Toyota, Pluralsite and Disney's Pixar Pictures. Attendees of this year’s forum will be introduced to Dr. Deming's revolutionary business philosophy through engaging discussions with Dr. Paul Zak, neuroeconomist and author, Kevin Edwards Cahill, executive director of The Deming Institute, Dr. Bill Bellows, deputy director of The Deming Institute, and Keith Sparkjoy, associate trustee of The Deming Institute. 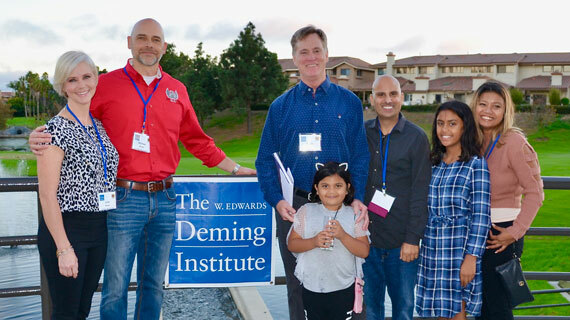 Understanding the value and impact of the Deming System of Profound Knowledge, Dr. Ravi Roy, the director of the W. Edwards Deming Incubator for Quality, Innovation & Leadership at SUU, established a partnership with the W. Edwards Deming Institute in 2017. “Building upon my longtime involvement with the Deming Institute, I initiated the idea for a new Incubator that could serve as an experimental laboratory for new ideas and partnerships around the Deming philosophy,” said Roy. Students, faculty, community members, and professionals in both the public and private sector who seek to improve the productivity and effectiveness of their organizations are welcome. All participants will leave with a new and deeper appreciation of the applicability of the Deming method, as well as receive a "Certificate of Participation" from SUU. This event is free for all Utah residents (the cost for non-Utah residents is $250 per person). Lunch and end of day networking reception are included however, registration is required. The Deming philosophy focuses on transforming employer and employee thinking patterns to improve quality and increase productivity. For more information, please contact Dr. Ravi Roy at royr@suu.edu.